Locate and Open the nsconfig.ini file on your computer where the application was installed. The included SQL server plug-in works on the following Microsoft SQL servers: 2005 and 2008. 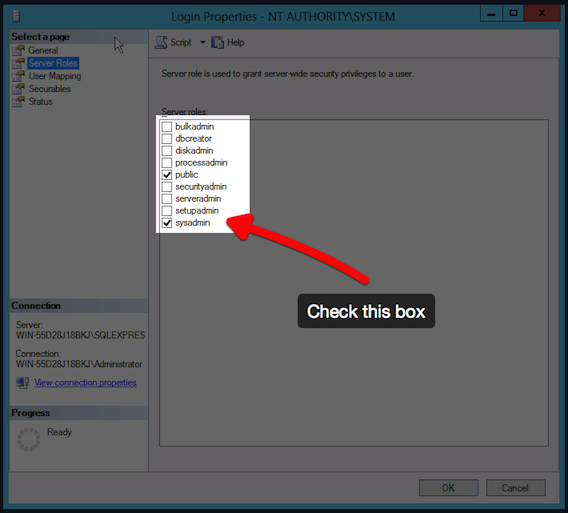 If the client is installed on one of the supported platforms listed above and you have an active SQL plug-in, you may select your SQL server for backup using the file selection tree or list view under the Backup Tab. If you check the box next to the server name, all databases will be selected for backup. To select only a specific database, expand the SQL Server object by clicking on the + symbol and check only the appropriate databases you want to backup. Restart the Steelgate Service before you re-open the program. Execute the following: regsvr32 "c:\Program Files\Steelgate\Steelgate Steelgate\SQLDMO.DLL"
Restart the Steelgate Service and open the Steelgate program. 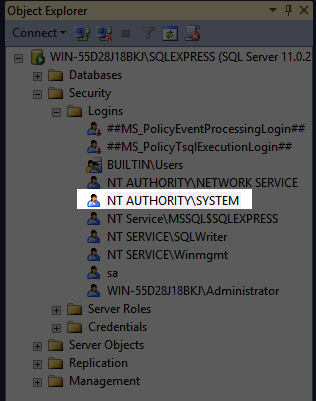 You will need to modify the permissions of the NT Authority\System user within the SQL management studio (Please see images below). Once modified, you will need to restart your SQL server service. Where do I change the Temp folder for SQL and Exchange? Open the software and from the home page, click on Settings / Defaults Settings / Advanced Options. Change the path of the temp folder on that screen.